Most of the best creativity tips and research I've come across were summarized in a rather well-known lecture by John Cleese (the screenwriter/actor known for his work on such comedy classics as Faulty Towers, the Monty Python TV series and films, A Fish Called Wanda, and Fierce Creatures. The lecture is sometimes available on Youtube, but last I checked it was unauthorized. So let me give you my take on the material. When we write, we can be in one of two different states of mind -- either the open mode or the closed mode. The table below summarizes the differences between them. Both these modes have their uses. The Open Mode is the Creative Mode. It is the state of mind that helps you generate ideas, that lets you be open to new possibilities. It is the best mode to be in when writing or brainstorming. On the other hand, the Closed Mode is the Critical Mode. It is the state of mind that helps you spot what needs improvement or reject whatever fails to meet your highest standards. Being in the Closed Mode helps a lot with editing, revising, or proofreading a piece of writing. One thing you must know: it is impossible to be in both modes at the same time, because they interfere with each other. It is very hard to be creative when in the Closed mode, because you will criticize every idea that comes along. Writer's block can result when your critical self takes over and bullies your creative self into silence, often without your become aware of it. On the other hand, it is very hard to revise a manuscript if you are in the Open Mode because you will simply keep adding new ideas, regardless whether they work with the established storyline or not, until the story becomes a sprawling mess. The Closed Mode is required when you need to prune away everything that doesn't fit. We are born creative geniuses. The book, Break Point and Beyond, by George Land and Beth Jarman notes that young children are incredibly creative, with 98% of toddlers score at genius levels for divergent thinking. However, only 18% of 13-15-year-olds score so highly. I believe this is because everyone is born with a creative self, but we develop our critical self as we grow up. If you spend time with young children, you can easily see that they are naturally in the open mode. They accept ideas easily and take great pleasure in imagination. As we get older, we gradually learn that not every idea should be accepted. Some ideas are wrong or impractical or will get disapproval. In time,, we learn to suppress our creative selves most of the time. As adult writers, our challenge is be more like children when we want to create. We need to consciously suspend our critical selves and enter the open mode in order to re-access our creative self. "You can't be spontaneous within reason." Pick a special place where you will do your writing -- a place where you will not be disturbed by other people or distractions. Cleese calls such spaces "oases of space." For many writers, a home office works, as long as the rest of the household agree not to intrude. But any room will do as long as you can have privacy. 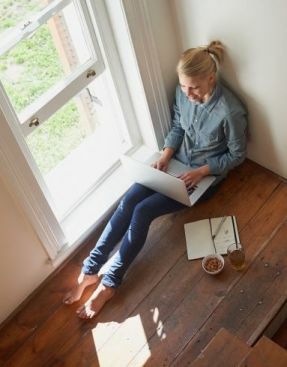 Ideally, you should not have a TV, cellphone, or any device with an Internet connection in your space, because they can be too distracting. If you don't have the luxury of privacy where you live, you can perhaps find it in a public place such as a library, park, public transit, or cafe. Anywhere you won't be disturbed by people who know you will work. Whatever place you choose, consistently using it as your writing place will help you develop the habit of being more focused and creative there. Creativity Tip #2: Set aside time to be creative. Decide on a set period of time in which you will write undisturbed. Ideally, it should be at least 90 minutes because it can take some time to get yourself into the Open Mode. On the other hand, few writers can work for more than four hours at a stretch. Some writers with families find it works to get up an hour or half an hour before the rest of the family and make that their writing time. Or they may choose a time after the children are in bed. Others may designate one day a week as their writing time (with support from their spouse). Some people have found that they can write just 10 minutes a day and be productive, if longer stretches seem too daunting.You know what will work for your situation. Try to consistently schedule your writing sessions for the same time each day/week, again to develop a habit. You can train your mind in this way to enter the Open Mode more easily. You may want to set a timer to let you know when your creativity time is over (so you won't be tempted to watch the clock). Losing track of time when you're doing creative work is a good thing. Incidentally, some writers don't have a set time. Instead they write a set number of words or pages and quit once they've reached their goal. I don't recommend this, because if anxiety causes you to get stuck on a story, staying up late and trying to force yourself to write a set number of pages may only create more anxiety and frustration. Creativity tip #3: Take your time. Often the best ideas only emerge after lengthy pondering. So don't necessarily take the first idea that comes along. Take time to let the various ideas sit with you before you reject any. Postpone creative decisions as long as possible. Let the discomfort of indecision be your friend. For instance, maybe you write an outline for a novel, but there are gaps where you're not sure what should happen. Don't be in a rush to fill them. It's okay to leave some areas blank for a while. By the time you get to that spot in your first draft, the right choice may be much clearer -- or an even better idea will have come along. Creativity Tip #4: Banish self-doubt. Be confident in your ability to write your story. During a writing session, recognize that great ideas will come to you if you give yourself permission to have a lot of bad ideas too. Another day you can have a session where you evaluate and criticize your ideas and decide which ones to keep. But don't try to be creative and critical in the same session. Similarly, try not to judge your first draft until after you've finished it. Stay out of the Closed/Critical Mode until you reach the revision stage. Remember: the Open/Creative Mode is a very childlike state. And children are natural born clowns. Silliness, absurdity, and playfulness can take you to the open mode faster than anything. Often a silly or ridiculous idea can be a stepping stone to the next brilliant idea, if you don't reject it out of hand. Remember, you chose to be a writer because you enjoy writing. Don't take the fun out of it by getting anxious and stressed. That's all of the creativity tips John Cleese presented. If you want to hear them in his own words, check out John Cleese's Creativity Tips on Youtube (if it's still available). Creativity Tip #6: Follow your heart. Sometimes when people start writing, they try to write what they think they "should" write, rather than what interests them. For example, if you were an English major in university, you may have accepted the notion that literary fiction is the only genre worthy of being written. However, it may be that your real talent and passion lies in romance or children's writing, or some plot-driven genre that you have been taught to look down your nose at. So what? Genre fiction pays more anyway, so go ahead and write what interests you, what you'll have fun writing. Or the reverse could be true. Maybe you love Westerns or SF and they are what you think you want to write. But then you find your stories leaning far closer towards more literary styles and themes. So what? Maybe your SF novel is too literary for some genre fans, but it might win accolades from literary critics and usher in a trend towards more sophisticated genre writing. In other words, don't deny your own interests, talents, and passions. Embrace them. And be willing to explore genres you've neglected until now. You may discover that some interest you more than you expect. You have to be enthusiastic about a story to finish it. So write what you love, whatever it is. If you love it, most likely others will too.